World Book Day is a yearly event first week of March, "designated by UNESCO as a worldwide celebration of books and reading, and marked in over 100 countries all over the world"*. On this occasion, we are pleased to invite visitors and readers of our website to celebrate reading and meditating on the various dimensions of the book in history and in our present culture. 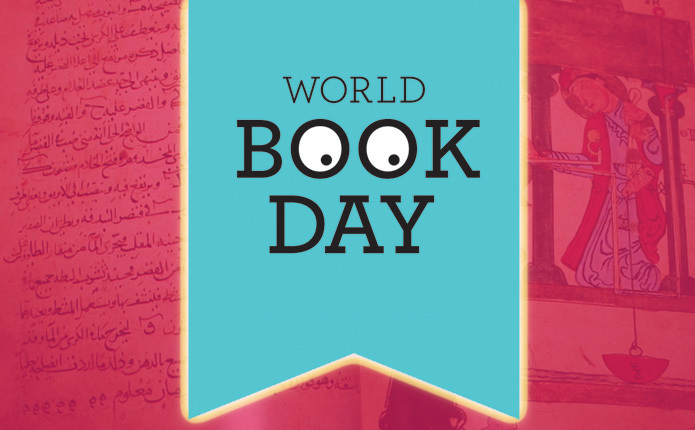 In the Muslim world, the celebration of the World Book Day is an opportunity to renew the commemoration of books and reading with remembrance of the heritage. Islam is the religion of the book, including the book par excellence, the Quran. Whose first revealed verse starts with the word “Read” In the classical Islamic civilisation, interest in books developed very early through reading, writing, authoring and dissemination of learning. Books became a visible medium within the first century of Islamic history. Muslims soon came to know and spread the use of paper, calligraphy, illumination, binding, publishing, marketing, lending and collection development, to name a few. Books became popular through book stores, writers, editors, copyist, translators, and most importantly, libraries. Libraries began in mosques, then in private homes and palaces. Public, school, academic and research libraries soon followed. The famous institution of Baghdad, the House of Wisdom, founded by the Abbasid Caliphs, which radiated knowledge throughout the world started as a library. Despite this advancement status of the book in the civilization, few comprehensive surveys exist on its historiography. At the Foundation for Science, Technology and Civilisation (FSTC), our major interest is in offering a tenable and sustainable history of science and technology that recognises the contributions of all cultures, as against the presently, mainly Euro-centric history, offered in most schools and institutions. "The Mechanical Corpus of Al-Isfizārī in the Sciences of Weights and Ingenious Devices: New Arabic Texts in Theoretical and Practical Mechanics" by Professor Mohammed Abattouy, former chief editor of FSTC and Professor Salim Al-Hassani, President of FSTC. Up until recently, academic endeavour in medieval Muslim engineering was confined largely to few prominent figures, such as the Banū Mūsa (flourished ninth century CE), al-Jazarī (d. ca. 1206 CE), and Taqī al-Dīn ibn Maʿrūf (d. 1588), thanks mainly to the pioneering work of Eilhard Weidermann (d. 1928), Donald Routledge Hill (d. 1994) and Ahmad Yusuf al-Hassan (d. 2009). The edition of the corpus of mechanics of al-Isfizārī brings to light for the first time a new and large corpus of reworkings, commentaries, and recensions by a great, but previously obscure, scholar of mechanics from the generation preceding al-Khāzinī. One of his great achievements in mechanics was that he expanded the horizons of our knowledge of medieval mechanics, engineering, and technology as practiced by the scholars of the classical Islamic world. The publication of a critical edition of al-Isfazārī’s scholarship in theoretical and practical mechanics is, therefore, a highly significant publication in the field of mechanics and engineering history, and should prove to be a real treasure for the academic and the interested layman alike. The main aim of this pack is to help teachers explain science content in an exciting and hands-on approach. The Teachers' Pack maps relevant historical scientific and technological discoveries and principles, from the Muslim Civilisation, to the national curriculum for secondary schools (ages 11 to 16). The guide starts with 35 Quizzily Questions to keep track of how well students are absorbing and remembering what they are reading and studying in the 1001 Inventions book. The section after introduces suggestions for a number of activities related to the book. Following the interactive experiences, there are specific projects that enhance and explore information presented on particular subjects.